Vintage Brewing Co. is a brew pub that has popped up on Madison’s radar for high quality since they first opened. They have a fairly dependable set of regular customers and an even more dependable beer menu when looking for either a crowd-pleaser or the more obscure beers like the grätzer beer “The Grodz,” which is on the hot seat today. First off, this is a grätzer beer which is a kind of smokebeer, Polish in origin (I think) and typically identifiable by its wheat composition, light color, and light taste. Grätzer’s are the shandy’s of the smokebeer world. They are great to throw down on hot summer days when stuck doing yard work, as an orange juice substitute at breakfast, or to alternate in between regular beer when you’re trying to slow the party train down. Whatever the occasion, you might find yourself in the same camp as The Ministry where the consensus is that this is a good (5 out of 7) grätzer, but only a mediocre smokebeer (4 out of 7). It’s like trying to compare Modelo, Pacifico, or Corona with anything that Germany produces. There’s a time and a place for this beer, and because of that, the conditional 5 out of 7 Smokestacks is issued. 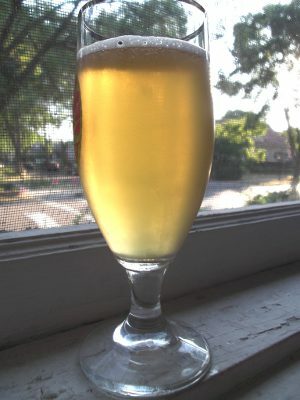 Brewer’s Description Brewed regionally since the Middle Ages but nearly forgotten today, the Grodziskie (aka Grätzer) style oak-smoked wheat beer hails from western Poland. Light, crisp and refreshing, yet full of flavor and accented by a distinctive smokiness, The Grodz makes a great session beer! This entry was posted in Beer, Educate, Enlighten, rauchbier, Smokebeer and tagged 5 - 6, gratzer, oak, Vintage Brewing, wheat, Wisconsin. Bookmark the permalink.